Adventure through an interactive world as you complete quests and discover the Biblical Letters of John in a whole new light. 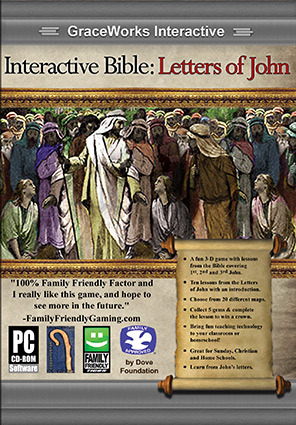 The Interactive Bible: Letters of John is a fun, 3-D game combining lessons from the entire Biblical Letters of John. There are 12 lessons from the Bible grouped together by theme, and all the lessons of John are in the game. A great Bible-based product for your family, church or home school as it promotes understanding and retention while providing positive experiences for students. Students 10 and older will enjoy it. Younger students will also enjoy it as they play with their parents. 12 unique lessons and 20 levels to explore and better understand the Bible. Contains core Christian virtues and ideals.